During the heat of the 2016 presidential elections, officials within the Obama administration, including cabinet-level officials who answered to Obama directly, extensively spied on the campaign of then-candidate Donald Trump. Both the Department of Justice inspector general and the House intelligence committee are currently probing the actions of the Obama officials and their motivations. So far, at least five different ways that the officials spied on the Trump campaign have been uncovered. These include the use of national security letters, a FISA warrant, an undercover informant, the unmasking of identities in intelligence reports, and spying conducted by foreign intelligence agencies. Each of these methods provided the officials with sensitive information on the Trump campaign that could have been used for political purposes. Private communications between FBI officials involved in the agency’s investigation on the Trump campaign, reveal its links to the White House. In one of the text messages obtained by the DOJ inspector general, and since released publicly, the lead FBI agent on the case, Peter Strzok, wrote in a Sept. 2, 2016, message to FBI lawyer Lisa Page that “potus [president of the United States] wants to know everything we’re doing.” Page was serving as counsel to then-Deputy FBI Director Andrew McCabe. There have also been direct ties between the spying and the campaign of then-Democratic presidential candidate Hillary Clinton. The FBI and DOJ relied heavily on unverified allegations contained in the so-called Trump dossier, paid for by the Clinton campaign and the Democratic National Committee (DNC), to obtain a FISA warrant to spy on Trump campaign volunteer Carter Page. 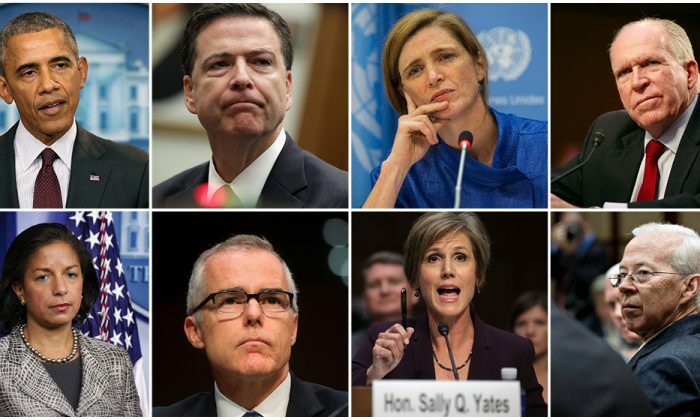 The FBI, which at the time was headed by FBI Director James Comey and Deputy Director McCabe, used counterintelligence tools known as national security letters to spy on the Trump campaign. Marc Ruskin, a 27-year veteran of the FBI, told The Epoch Times that the agency has strict guidelines regulating the use of different types of investigations, such as national security, criminal, and terrorism investigations. Launching a foreign counterintelligence investigation (FCI), which falls under the FBI’s national security guidelines, must meet a lower bar of probable cause than do criminal investigations. Using an FCI to investigate the Trump campaign, the FBI was able to gather intelligence—not necessarily evidence—which it would likely not have been able to do using a criminal investigation, given the lack of probable cause. However, the FBI appears to have used the FCI tools—potentially illegally—to launch a subsequent criminal investigation. Comey told Congress under oath in June 2017 that the investigation did not target Trump, even though it had spied on his campaign. Similarly, Deputy Attorney General Rod Rosenstein, who oversees the investigation by special counsel Robert Mueller, said in April that Trump is not a target of Mueller’s investigation. The FBI and DOJ obtained a FISA spy warrant on Carter Page, a volunteer adviser to the Trump campaign, on Oct. 21, 2016. Under the so-called “two-hop” rule, the FISA warrant could have been used to spy on anyone with two layers of separation from Page himself. This means that both of the people Page was in contact with himself at the campaign could have had their communications surveilled, which is the first hop, as well as anyone who was in contact with the campaign officials, the second hop. This means that even though Carter Page never talked to Trump himself, as said by Page in a Feb. 6 ABC News interview, Trump could still be spied on, because Page had contact with one of his campaign officials. Because Page is a U.S. citizen, the application had to be certified by the FBI director or deputy director. Comey signed off on three of the applications, which include renewals, and McCabe signed one. Deputy attorney generals Sally Yates, Dana Boente, and Rosenstein each signed one or more applications on behalf of the DOJ. A FISA warrant is among the most intrusive ways to spy on an individual. It includes access to data collected under Section 702 of the Foreign Intelligence Surveillance Act. This data includes all digital communications—such as internet browsing histories, phone conversations, emails, chat logs, personal images, and GPS locations—that are transferred over the internet and captured by the NSA using so-called upstream data, which is all internet data traveling through key internet backbone carriers. The FBI itself has access to 702 collected data collected by the NSA. A declassified top-secret Foreign Intelligence Surveillance Court (FISC) report released in April 2017 detailed numerous violations by the FBI in handling this data. Among the violations were the FBI’s providing of access to raw FISA data to private contractors, in violation of policies intended to safeguard the data. The contractors were also found to have maintained access to the sensitive data, which includes communications of Americans, after the contractors’ work for the FBI was concluded. The FBI also provided 702 data to a private entity that did not have the legal right to it. According to the FISC, the FBI also did not give oversight or supervision on how the data was used. It is unclear which private entity the FBI provided the information to. It is unclear at this point in time whether the communications of Trump and his campaign were provided to outside private entities. In addition to the FBI’s mishandling of Section 702-acquired data, the declassified FISC report shows numerous violations under the Obama administration of procedures intended to safeguard Americans’ personal data and communications. For example, the NSA had an 85 percent noncompliance rate with guidelines for when it came to searches involving American citizens. Top Obama officials made hundreds of so-called unmasking requests for the identities of members of the Trump campaign in intelligence reports. Unmasking refers to the practice of requesting that an intelligence agency, in most cases the NSA, unmask the name of an American citizen, which by default is concealed in intelligence reports to protect identities. Obama’s national security adviser, Susan Rice, Ambassador to the U.N. Samantha Power, and CIA Director John Brennan have so far been identified by the House intelligence committee as having filed such requests. Power testified before the House oversight committee in October last year that even though unmasking requests were made in her name, they were in fact made by another undisclosed official. The communications obtained by Rice and Brennan could have been provided to Obama during the daily intelligence briefings he received from them. The FBI used an undercover agent to infiltrate the Trump campaign. Stefan Halper, a Cambridge professor with ties to the CIA and British intelligence agency MI6, reached out to Carter Page; George Papadopoulos, a volunteer foreign policy adviser to the Trump campaign; and Sam Clovis, a senior Trump campaign official. Halper received over $1 million from a Defense Department think tank between 2012 and 2017. According to media reports, Halper met with Carter Page as early as July 2016, the same month the FBI opened its counterintelligence investigation into the Trump campaign. On May 20, the DOJ, under the direction of Trump, ordered its inspector general to look into the actions of the FBI informant. It expands the scope of the investigation by Inspector General Michael Horowitz, whose office is already investigating the FBI’s use of a FISA warrant to spy on the Trump campaign. British Intelligence agency GCHQ provided officials within the CIA, both members of the “Five Eyes” intelligence alliance, information on the Trump campaign as early as late 2015, The Guardian reported. According to the publication, then-head of GCHQ Robert Hannigan provided then-CIA Director John Brennan with sensitive information on the Trump campaign on a “director level” in the summer of 2016. Brennan subsequently prepared an “eyes only” report for Obama and three senior aides. Brennan also provided briefings to the members of the “Gang of Eight” (the House and Senate majority and minority leaders, as well as the chairmen and ranking members on the House and Senate intelligence committees). That GCHQ’s Hannigan provided Brennan with the information on the Trump campaign is highly unusual, as the House Intelligence Committee has found that no official Five Eyes intelligence product exists. “We are not supposed to spy on each other’s citizens, and it’s worked well. And it continues to work well. And we know it’s working well because there was no intelligence that passed through the Five Eyes channels to our government,” Chairman of the House intelligence committee Devin Nunes told Maria Bartiromo on Sunday Morning Futures on April 22. The Five Eyes alliance uses strict guidelines to make sure that participating intelligence agencies in the United States, UK Canada, Australia, and New Zealand don’t spy on each other’s citizens. The guidelines aim to prevent, for example, the U.S. government from using intelligence obtained by the Five Eyes to gain communications of Americans­—which the government is not allowed to monitor without a warrant. However, Hannigan and Brennan appear to have done exactly that by circumventing official channels, thus explaining why no official intelligence product exists. The fact that no official intelligence exists that was used to open the investigation into the alleged collusion between the Trump campaign and Russia means that those involved went around the official system. Hannigan unexpectedly announced he was resigning from his post just three days after Trump was inaugurated.